Music Rights Unveiled provides an inside look at the complex world of music rights for film and video and includes step-by-step guidance to navigate these tricky waters. Authors Brooke Wentz and Maryam Battaglia share their decades of expertise in this user-friendly guide, designed specifically with filmmakers and producers in mind. The book provides a brief history of the pricing of music in film, television and digital media markets, and explains the process by which music is licensed or acquired for films, highlighting pitfalls to avoid and strategies for success. An in-depth explanation of building a budget for the music component of your media project. "Music Rights Unveiled is essential reading for anyone looking to educate themselves on the use of music-both original and licensed-in contemporary film, television and media. The book's plainspoken, practical advice on everything from hiring a composer to navigating the thicket of music licensing, is both relentlessly up-to-date as well as grounded in fascinating historical context." 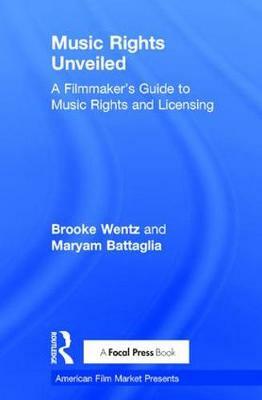 "This book is the go-to guide for learning how to license music for your film - highly-recommended for those filmmakers trying to figure out the complexities of music licensing and content use. Brooke knows more about licensing music than anyone I know in the business. I would never make a film without her help, and now you can learn all her licensing secrets yourself in her new guidebook." "Music Rights Unveiled is an invaluable, must-read book for all film and media producers. Brooke and Maryam write from the richness of their experience. By removing the veil on the changing landscape of rights clearances, they have provided a direct pipeline to the practical knowledge and best resources that your project needs."